PORTSMOUTH — Geographically speaking, it wasn’t a big move at all. Yet, according to owner Emily Brackett, it was the biggest and best move she has made. 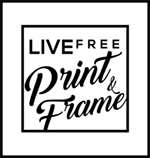 Live Free Photography opened a little over a year ago at 16 Sheafe St. This past autumn, Brackett moved her business across the street to 11 Sheafe St.
Brackett said she looked out the window one day and saw the “for rent” sign. She walked over and found her new location. In fact, the past year has been so great that Brackett has not only doubled her space, she has invested in new equipment that will enable her to do all her work on the premises. She has also become business associates with Michael Winters, another photographer. Brackett now has room for a showroom in the front and the back room is for the equipment and studio. Brackett does movie transfers from 16mm, 8mm and VHS. The business also offers scanning services for slides, photos, film and art. Printing, photo restoration, custom framing and film supplies are available. “I can print on fine art paper as well as all my other projects,” she said. Brackett said people love knowing all the work is done on the premises. No fear of priceless family photos or films being lost in the mail, she explained. Brackett said that running out of space at her first location led her to revise her business plan and concentrate on exactly what she wanted for her business. In other words, she explained, no more running around, using up gas and spending so much time using equipment elsewhere in the region. Brackett said jobs can now be accomplished faster and with less money spent out of the store. In the showroom, Brackett sells prints by David Mendelsohn, a local photographer who travels the world taking photos. During the winter months, Brackett said a “by appointment” policy is working out well as the store’s regular hours are shortened until the weather gets warmer.